Well our first level debut wasn't all that inspiring. Junior did well schooling yesterday, almost too well. There were several things we'd been working on and assumed I just wouldn't have it for the show that he seemed to miraculously pull out of his hat and had several light bulb moments where things were coming together......but then there was today. He behaved like a champ except when it came to riding the tests. He didn't exactly misbehave but let's just say I thought I was on a toddler who with every request to supple/relax he was daring me to 'make him do it'....Now that isn't to say that we didn't do 'it.' I mean we scored a 64 and change at first level test 2 and made a a showing at first level test 1 later in the day for a 61; but, instead of becoming more supple and cooperative he just remained, well, stiff/braced without being upside down or behind the bit or inverted......or above the bit....just braced. 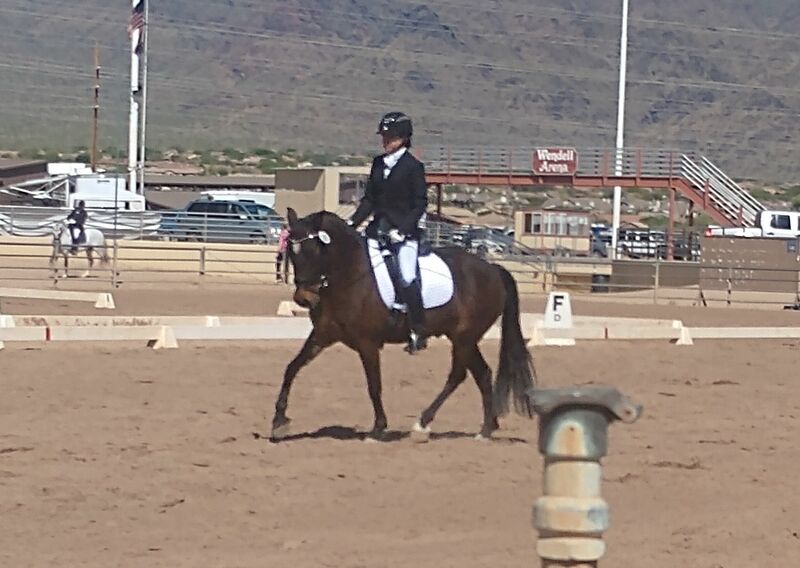 We did get some very nice comments and the judges most definitely scored the tests I rode. It wasn't totally dismal for our first outing at first level without any schooling shows or chances to really prepare. He wasn't spooky....................He didn't flip out like some of the horses did today......he just didn't want to be there doing the test - eating hay at the trailer was a-okay, walking around sightseeing the show grounds was a-okay, being ridden wasn't too much trouble in fact he was extremely well behaved..........Suffice it to day it gives us confirmation of where I thought we were at and where we have to go. We'll see if we make our way there by fall. Here is a video. I know there isn't much to say - no lengthening, no difference shown, rushing and not particularly signing up to accepting the bit in the canter departs......he was just stiff and reticent though obedient with the exception of the first canter depart where we almost left the arena (though far less dramatic than I've had in the past with some predecessors lol). Not where we want to be but it's a start. I would love to be where you are. No nasty surprises and you know what your homework is. Good or him for being obedient and not freaking out. He is still young. I think we put a lot of pressure on ourselves by watching the 3,4, and 5 yo young horse tests and champions. Or maybe you don't and that's just me. It's good to have high standards, he'll rise to them. Well done! Thank you heddylamar - the spooky things were mostly the flags flapping in the wind, the big gulp cups (trash) blowing by and the various tents that were being noisy due to the wind that was kicking up at the time. Nothing extraordinary to be sure but the typical things that will scare horses that are away from home. I'm afraid my horses have all been exposed to kids and normal life, not really being shielded by much. exvet you should be very pleased with your young boy! He came he was for the most part obedient (I've ridden that left canter move before:) did his job and kept his cool. Good for him! Room for improvement? Of course but isn't there always? 64 for first level test first time is nothing to sneeze at. If I was closer to you I would help you with your teeth floating no problem. I am putting some time with Joplin working in hand with the bit bridle before I move on with her. She is fussy with the bit when you activate it (carries it quietly when working off the caveson) so I am taking the time now to educate her in the bridle. There are a few things I do that I think are very good for the horse's education. Teaching stelling, that slight lateral bending checking the fluidity of it. Teaching the release in ward and down ward to the inside rein and teaching the release of the TMJ. I wished I had spent more time with Rip early on doing this and I might not have had as much issues US as I did. He pulled the same move Junior does on the left rein. Not in the transition but in a certain area in the arena. He does not do that anymore thank goodness, but did for quite awhile. You've done an awesome job of preparing your young one for having a productive life with you. Pat yourself on the back for your training, before you know it you and he will be at FEI. Thank you khall. I wish we lived closer too. I think we could share a lot of resources to help each other out on many fronts. I agree that in hand work will be the key to preventing some issues I've had with others as well. I also have a skid steer now which will help me finish my arena. The footing has not been the best (too deep in too many spots) that it has really limited my opportunities to work in hand and ride in it. I'm grateful that my neighbor allows me to use his huge reining arena but he doesn't have lights and with work and the coming summer months, riding at night is really where I've had the advantage in the past. To this point there was never any pressure to get it all done because I wasn't going to drill stuff for training or first level. As we progress, though, I will need to up the ante on my end. We'll keep chipping away at everything. I'm sure taking the time with Joplin to focus on more in hand work now will pay off in the long run for you too. Looking forward to seeing more pictures as you two progress. Exvet, really great job! Getting a youngster to be obedient, fairly steady and calm with showing is huge. He is learning so much now and it will be exciting to see where you are in a few years. I'd be very happy with that ride. He's cute. Really good job with Junior exvet. 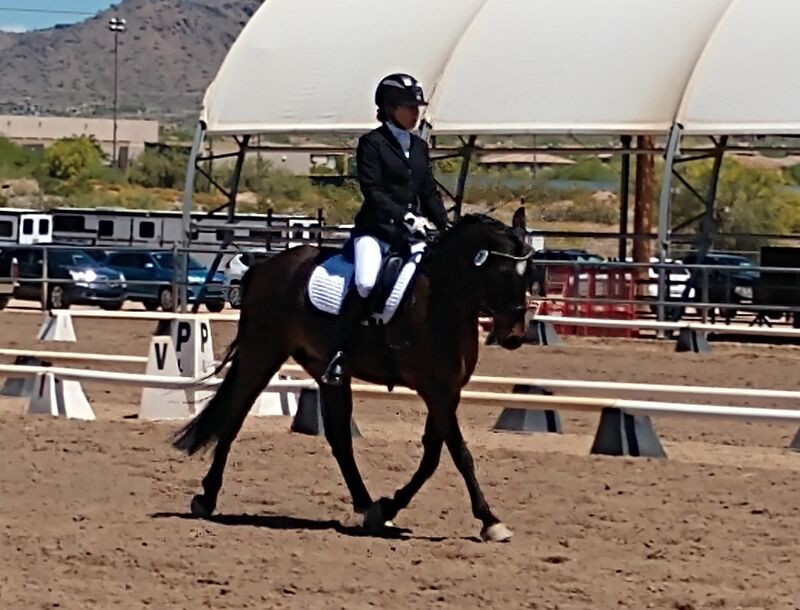 He looked confident and ready to be out there doing first level--great start to the show season. I no longer float my own horses' teeth, my shoulders won't do it anymore. I have dh trailer them to a clinic down the road so that I don't have to be worried "mom" while they are tranq'd. I've become such a weany in my "old age." Thank you for the kind words everyone. I really appreciate them. Sue B I should probably have a colleague I work with come out here and do it but I just look at my 2K amount of equipment which is all in great working order and haven't completely given up on that ghost. In fact I just sucked it up and did Junior's teeth this morning after I rode. I tranq'd him and stood there in the barn aisle with all my stuff. Fortunately I have a head lamp & rafters so that I can throw rope up over the beam. Junior was a good egg and enjoyed his drugs. I have a lesson tomorrow so we'll see if it makes any difference. I didn't have it in me to do the others. I'm hoping when my son comes for Easter I can convince him that it would be a nice thing to do for his Mom - and help with the rest, especially if I pay him for his time. Having some assistance does make it go faster even if it still takes a toll on one's shoulders and for me because I have ponies, my quads - all that stinking squatting. Nice ride! It was very straight and smooth....! Very well done, I thought?